Trainin, G., Friedrich, L. & Deng, Q. (2018). The Impact of a Teacher Education Program Re-design on Technology Integration in Elementary Preservice Teachers: A Five Year Multi-Cohort Study. 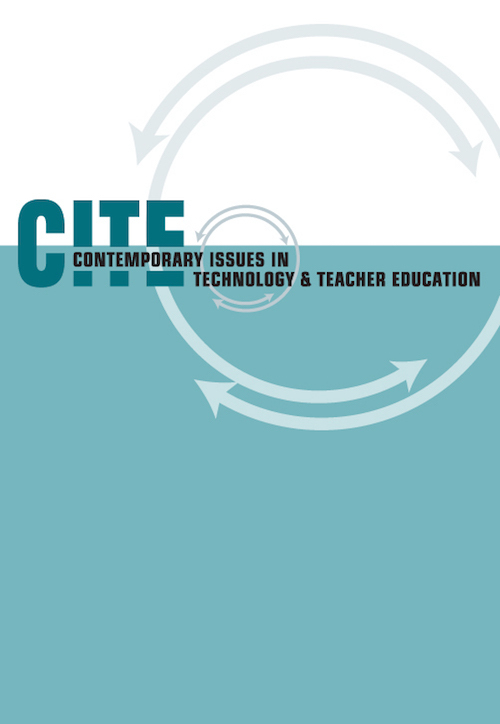 Contemporary Issues in Technology and Teacher Education, 18 (4), 692-721. Waynesville, NC USA: Society for Information Technology & Teacher Education. Retrieved April 25, 2019 from https://www.learntechlib.org/primary/p/182424/. Abbitt, J.T. (2011). An investigation of the relationship between self-efficacy beliefs about technology integration and technological pedagogical content knowledge (TPACK) among preservice teachers. Journal of Digital Learning in Teacher Education, 27(4), 134-143. Baran, E., Canbazoglu Bilici, S., Albayrak Sari, A., & Tondeur, J. (2017). Investigating the impact of teacher education strategies on preservice teachers' TPACK. British Journal of Educational Technology (Early view). Bauer, J., & Kenton, J. (2005). Toward technology integration in schools: Why it is not happening. Journal of Technology and Teacher Education, 13, 519–546. Bentler, P.M. (1990). Comparative fit indexes in structural models. Psychological bulletin, 107(2), 238-246. Bruce, D.L., & Chiu, M.M. (2015). Composing with new technology: Teacher reflections on learning digital video. Journal of Teacher Education, 66(3), 272-287. Friedrich, L., & Trainin, G. (2016). Paving the way for new literacies integration in elementary teacher education. Creative Education, 7, 1456-1474. Grossman, P., Hammerness, K., & McDonald, M. (2009). Redefining teaching, reimagining teacher education. Teachers and Teaching: Theory and Practice, 15(2), 273-289. Hofer, M., & Grandgenett, N. (2012). TPACK development in teacher education: A longitudinal study of preservice teachers in a secondary M.A.Ed. Program. Journal of Research on Technology in Education, 45(1), 83-106. Howard, S.K., Chan, A., Mozejko, A., & Caputi, P. (2015). Technology practices: Confirmatory factor analysis and exploration of teachers’ technology integration in subject areas. Computers& Education, 90, 24-35. Hu, L., & Bentler, P.M. (1999). Cutoff criteria for fit indexes in covariance structure analysis: Conventional criteria versus new alternatives. Structural Equation Modeling, 6(1), 1-55. Hutchison, A. (2012). Literacy teachers’ perceptions of professional development that increases integration of technology into literacy instruction. Technology, Pedagogy and Education, 21(1), 37-56. Kline, R.B. (2011). Principles and practice of structural equation modeling (3rd ed.). New York, NY: The Guilford Press. Koehler, M., Shin, T.S., & Mishra, P. (2012). How do we measure TPACK: Let me count the ways. In R.R. Ronau, C. Rakes, & M.L. Niess (Eds. ), Educational technology, teacher knowledge, and classroom impact: A research handbook on frameworks and approaches (pp. 16–31). Hershey, PA: IGI Global. Kopcha, T.J. (2012). Teachers' perceptions of the barriers to technology integration and practices with technology under situated professional development. Computers& Education, 59(4), 1109-1121. Latta, M.M., & Wunder, S. (2012). Placing practitioner knowledge at the center of teacher education. Charlotte, NC: Information Age Publishing. Lortie, D. (1975). Schoolteacher: A sociological study. London, UK: University of Chicago Press. Male, T., & Burden, K. (2014). Access denied? Twenty-first-century technology in schools. Technology, Pedagogy and Education, 23(4), 423-437. Maor, D. (2017). Using TPACK to develop digital pedagogues: a higher education experience. Journal of Computers in Education, 4(1), 71-86. Martin, B. (2015). Successful implementation of TPACK in teacher preparation programs. International Journal on Integrating Technology in Education, 4, 17-26. Miles, M.B., & Huberman, A.M. (1994). Qualitative data analysis: An expanded source book. Thousand Oaks, CA: Sage Publications. Mouza, C., Karchmer-Klein, R., Nadakumar, R., Yilmaz Ozdem, S., & Hu, L. (2014). Investigating the impact of an integrated approach to the development of preservice teachers’ technological pedagogical content knowledge (TPACK). Computers& Education, 71, 206-221. Niess, M.L. (2005). Preparing teachers to teach science and mathematics with technology: developing a technology pedagogical content knowledge. Teaching and Teacher Education, 21, 509–523. Schmidt, D.A., Baran, E., Thompson, A.D., Mishra, P, Koehler, M.J., & Shin, T.S. (2009). Technological pedagogical content knowledge (TPACK): The development and validation of an assessment instrument for preservice teachers, Journal of Research on Technology in Education, 42(2), 123-149. Schunk D.H., & Pajares, F. (2009). Self-efficacy theory. In K.R. Wentzel & A. Wigfield (Eds. ), Handbook of Motivation at School (pp. 35–53). New York, NY: Routledge. Schunk, D., & Zimmerman, B. (2007). Influencing children’s self-efficacy and selfregulation of reading and writing through modeling. Reading& Writing Quarterly, 23(1), 7-25. Sheninger, E.C., & Murray, T.C. (2017). Learning transformed: 8 keys to designing tomorrow’s schools, today. Alexandria, VA: ASCD. Steiger, J.H. (1990). Structural model evaluation and modification: An interval estimation approach. Multivariate Behavioral Research, 25, 173−180. Thompson, B. (2000). Ten commandments of structural equation modeling. In L. Grimm & P. Yarnell (Eds. ), Reading and understanding more multivariate statistics (pp. 261284). Washington, DC: American Psychological Association. Tondeur, J., Pareja Roblin, N., van Braak, J., Voogt, J., & Prestridge, S. (2017). Preparing beginning teachers for technology integration in education: Ready for take-off? Technology, Pedagogy and Education, 26(2), 157-177. Walser, N. (2011). Teaching twenty-first century skills: What does it look like in practice? In N. Walser (Ed. ), Spotlight on technology in education: Harvard education letter spotlight, Series 7 (pp. 37-46). Cambridge, MA: Harvard Education Press. Wang, L., Ertmer, P.A., & Newby, T.J. (2004). Increasing preservice teachers’ self-efficacy beliefs for technology integration. Journal of Research on Technology in Education, 36(3), 231-250. Wepner, S.B., Ferrara, J., Rainville, K.N., Gomex, D.W., Lang, D.E., & Bigaouette, L. (2012). Changing suburbs, changing students: Helping school leaders face the challenges. Thousand Oaks, CA: Corwin Press. Wozney, L., Venkatesh, V., & Abrami, P.C. (2006). Implementing computer technologies: Teachers’ perceptions and practices. Journal of Technology and Teacher Education, 14, 173–207. Wright, V., & Wilson, E. (2005). From preservice to inservice teaching: A study of technology integration. Journal of Computing in Teacher Education, 22, 49-55.